Beneteau’s new Oceanis 41 delivers more than a just a change in hull form and an uptick in Euro styling. This new entry in the long-lived Oceanis line is fun to sail, easy to dock and makes a comfortable home afloat. One of the keys to Beneteau’s success has long been its dual approach to boatbuilding. By offering distinctly different boats to cruisers and racers, the company has been able to target the preferences of each clientele. The current Oceanis lineup features a rethinking of the hull shape that goes well beyond the signature chine that runs fore and aft just above the waterline. The new boat features a beamy stern section and wedge-shaped waterplane footprint. The ballast ratio is on the low end, but the newly engineered foil-shaped keel and rudder work in harmony with the canoe body. What’s apparent is that designers Finot-Conq had more than a fashion statement in mind when they drew the new lines. 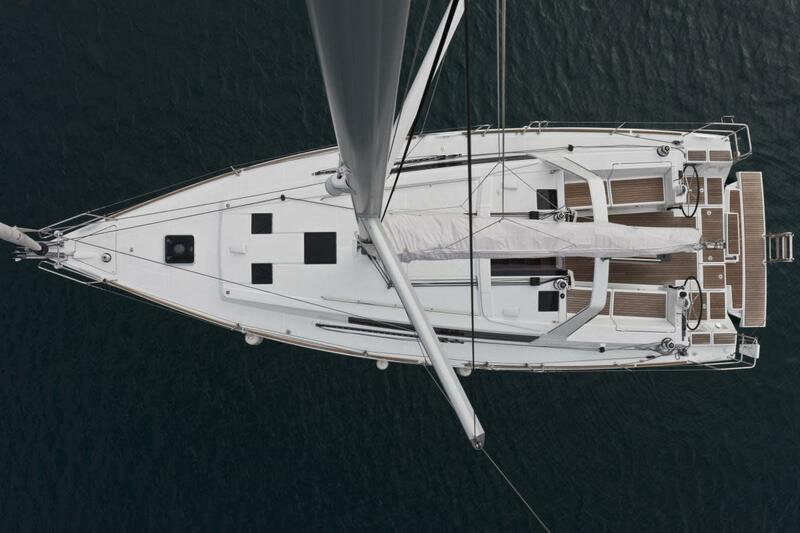 Beneteau continues to build solid fiberglass hulls that are stiffened by the addition of a molded grid and liner. The latter is bonded to the hull and provides both a finished inner surface, as well as crucial attachment surfaces for bulkheads, interior joiner work and even the engine beds. The complex deck structure does not go on until most of the interior has gone into the boat. The double-spreader, deck-stepped mast and the boom are aluminum. All in all, this is a solid boat, of the kind sailors have long come to expect from the world’s largest boatbuilder. The signature fiberglass arch—a feature on many new Beneteaus—and elevated mainsheet bridle does more than keep the mainsheet out of the way. It also serves as the backbone for a dodger or bimini. Halyards, control lines and reefing lines are logically clustered around rope clutches on either side of the companionway. A solidly fastened double bow roller keeps anchors and chain away from the relatively plumb stem. It can also be used as the tack point for a removable furling jib or asymmetric spinnaker. The mast has been moved aft to about 47 percent of the distance from the bow to stern, which adds more J dimension—or foredeck length—to the foretriangle and allows a large, nearly non-overlapping jib to be set on a 15/16th headstay and sheet inside the outboard chainplates, for a tight sheeting angle. The nice thing about outboard chainplates is that they afford a bulletproof chainplate-to-hull attachment, and also allow crew to pass easily along the side decks. The high-volume interior can be ordered in one of three different layouts. I sailed the two-cabin, one-head version, but owners can also choose three cabins and one head, or three cabins and two heads. The two-cabin/one-head layout had a roomy feel, although I was sorry not to see port and starboard sea berths. 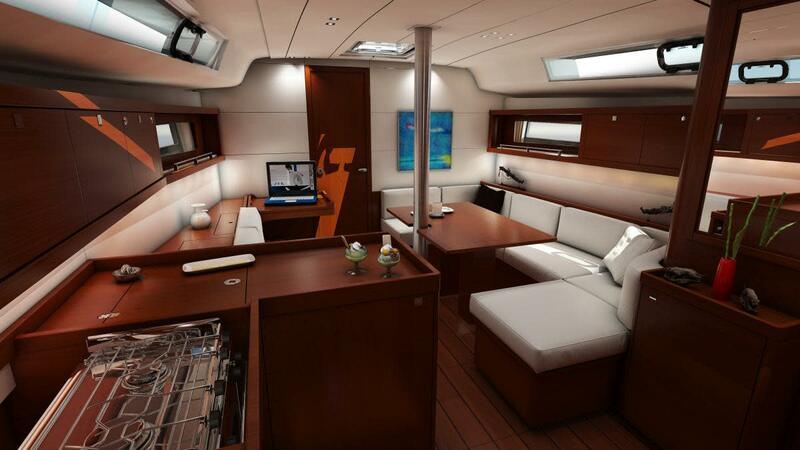 A convertible sliding nav station/end table that allows the settee to be configured for either navigation or hors d’oeuvres occupies the port side of the main saloon,. The L-shaped galley comes equipped with a two-burner stove and small oven, but is a little limited in terms of counter space. Beneteau pioneered factory-made boat interiors and continues to be a leader in this area. The joinery is comprised of high-quality hardwood veneers over plywood that is robotically cut to exact proportions. During assembly the hull liner and preassembled spray-finished joinery are all jigged up and bonded in place before the deck is placed on the hull. The labor saved in this automated approach to interior building allows Beneteau to invest in engineering advances while putting competitive price tags on its products. I sailed the Oceanis 41 on a breezy fall day on the Chesapeake. A 15-20 knot northwesterly with higher gusts was kicking up a chop, and right from the start I found the boat was responsive and willing to tolerate the puffs. I intentionally drove the 41 hard on the wind, assuming its wide stern would turn a deep heel angle into a rudder-releasing roundup. But not only did the boat refuse to misbehave, it maintained a comfortable helm despite almost 20 degrees of heel. Only when the puffs bore down at 25 knots did the rudder finally lose its grip. Even then, the result was a very demure rotation into the wind, a far cry from the auto-tack roundups I’ve experienced on many other wide-stern cruisers and raceboats. Decreasing the angle of heel had little effect on boat speed, but was a big plus in terms of crew comfort. On the wind we clocked 6.5 knots reefed and 6.9 knots when overcanvased. Off the wind we unwound the reefed sails and scooted along at about 7.5 knots. A furling gennaker or asymmetric spinnaker would undoubtedly have added even more boat speed. But in 20 knots of true wind, there was no need for the extra drama. Overall, a very nice boat on all points of sail. Returning to the dock, the boat slipped through flat seas at 6.5 knots at a fuel-efficient 2,600 rpm, and was very responsive to the helm. Its proprietary Dock & Go slow-speed maneuvering system made backing into a tight slip easier than ever. The joystick-controlled rotating saildrive and bow thruster are electrically linked, giving the person at the helm fingertip control of a sideways thrusting force that puts and end to all docking drama. The system&apos;s complexity increases costs and may have some long-term maintenance implications, but for many, the handling convenience will be more than worth the extra investment. With the new Oceanis 41, Beneteau has found a way to combine spacious accommodations with performance and solid construction quality at a competitive price point. This is a fine cruiser that will accommodate a wide range of sailing styles. DESIGNER Finot Conq & Assoc.